Rapides Cote d'Azur (RCA) operate local and express services in the South of France. 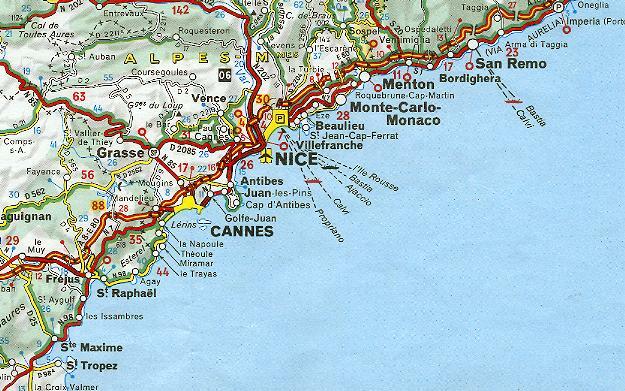 One of their main routes is from Nice to Cannes, which is run by air conditioned coaches. Pictured below are a selection of vehicles from June 2000. RCA 3879 (330AGE06), a recently delivered Renault Iliade, is seen at Golfe-Juan on its way to Cannes in June 2000. RCA bought slightly lower specification Renault Tracers in the 1990s. One of these, 3250 (8672ZV06), is seen here at Cannes bus station in June 2000. The 200 service is jointly operated with Autocars Nesa-Tavanti (TNR) from Nice. Their 53ACJ06 is seen at Place de Gaulle in Antibes in June 2000. Seen at Nice airport heading for Cannes is RCA 3869 (271AGE06) in June 2000. RCA also provide several express services from the airport to Cannes and Monaco.